In our last post, we discussed Agile, its origins, basic concepts, and how it fits into the organization. While we often speak of Agile generically, we have to discuss the development methodologies that share the common philosophical beliefs of Agile. 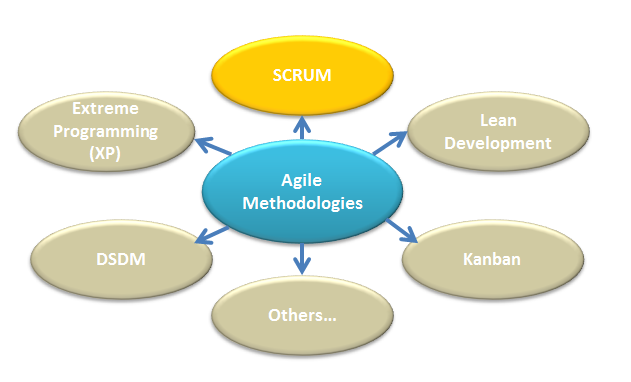 Scrum is the most prevalent of the Agile methodologies used in software development today, and rightfully so. With Scrum, development is executed via a series of short efforts called sprints. A sprint typically lasts from two to four weeks. The actual duration of each sprint is determined by the customer and the development team, but a sprint should not be too long. We’ll talk more that sprints later. Before we begin our discussion of Scrum, we first need to discuss some important terms and concepts associated with Scrum. Scrum Team – the Scrum team is generally made up of less than 10 developers, business analysts, testers, etc. but can be larger if the product necessitates it. The team is totally self-sufficient and able to execute sprints effectively. In Scrum, roles such as architect, engineer, developer, etc typically go out the window in lieu of a sense of a team effort and an “all-for-one and one-for-all” mindset. Scrum Master – the Scrum Master is a team member or manager whose primary responsibility is making the team as productive as possible. The Scrum master should be very well-versed in Scrum concepts and ideals and should insulate the team from outside influences and remove impediments that stand in the way of progress. Daily Scrum – one of the key concepts of Scrum is the daily scrum. This is a quick, stand-up meeting of the development team. The purpose of the daily scrum is to keep the team on track on a daily basis by discussing the following three things for each team member: (1) what did you do yesterday? (2) what are you going to do today, and (3) do you have any impediments? The Scrum Master leads the daily scrum and ensures that the meeting is productive and stays on track. Product Backlog – the Product Backlog is the all-inclusive list of every feature and component of every application that makes up the project as a whole. Sprint Backlog – the Sprint Backlog is created from the Product Backlog each sprint during the Sprint Planning meeting. It is made up of all the tasks to be completed within a specified sprint. Sprint Planning – the Sprint Planning meeting takes place before each sprint and is attended by the Scrum team members. The purpose of the Sprint Planning meeting is to define the work to be done by each person on the team for that sprint. Once this work has been defined and assigned, work items are moved from the Product Backlog to the Sprint Backlog. Sprint Retrospective – one of the most effective ways to ensure continuous improvement within a Scrum team is to learn from mistakes. The Sprint Retrospective meeting, which takes place and the end of a sprint allows the team members to discuss the happenings of the prior sprint and identify things that could have been done better. Product Owner – the Product Owner is the project’s primary stakeholder and is usually a member of functional management within the organization. Now that we know the key terms associated with Scrum, let’s talk about how the Scrum development process actually works! The necessary members of the team meet with the customer before work ever begins and identify to whatever extent possible the overall needs of the customer. These needs are not necessarily going to be truly complete and remember that Agile methodologies love change! But we do want to at least have a good understanding of what needs to be done to satisfy the customer’s needs and ensure that the results are in alignment with these needs. Once we have identified the needs, we build the Product Backlog. As we discussed in the previous section, the Product Backlog is the full, all-inclusive list of the features needed. The business analysts, who are Scrum team members as well then do their best to decompose those needs into quantifiable requirements. A good requirement is a requirement that is testable, so it is imperative that the requirements are developed in such a way that the developers are able to understand them and further decompose specific tasks necessary to develop the requirement in its entirety. Once we know (to the best of our ability) the Product Backlog, we can decide roughly how many sprints are needed to develop the functionality and assess the actual duration of each sprint. Based on the complexity of the features and the dynamics of the team, we may say that a three-week sprint is optimal, but sprints are typically from two to four weeks in length. Once we identify this duration, we generally want to stick to it and not deviate. Before we begin a sprint, the Scrum team holds a Sprint Planning meeting. In this meeting, they review the Product Backlog and each developer decides just how much he/she can take on and complete and often high-level estimates are given based on the concept of shirt sizes (S, M, L, XL, XXL, etc). Other approaches are used, but the point of the Sprint Planning meeting is to determine and vote upon just how long the team thinks each item should take to develop and test. The Sprint Planning meeting may last from an hour to an entire day, but the outcome is the movement of work items from the Product Backlog to the Sprint Backlog and assignment of specific tasks to individuals. What are you going to do today? Are there any impediments preventing you from getting things done? If there are valid impediments, it is the Scrum Master’s responsibility to remove those impediments through whatever means necessary. Generally, the Scrum Master should be a person with adequate authority and credibility with the customer to be able to communicate with the necessary people to resolve any impediments encountered. This is vitally important to the successful implementation of Scrum! Remember that as part of Agile, stakeholders are actively involved as often as is possible. It is not uncommon for stakeholders to be physically involved on a daily basis. During the sprint, developers may routinely do desk reviews with a stakeholder or stakeholders to verify proper functionality during development. A desk review is an informal, impromptu discussion/demonstration of a specific function with the customer. At the end of a sprint, the team formally presents the new functionality to the customer and receives feedback in a Sprint Review meeting. If the sprint has been properly executed and the customer has been actively involved during development, the functionality that the customer sees should bring no surprises. It is not uncommon during Sprint Review meetings for the customer to engage in in-depth discussion about the business needs and it is also fairly common for there to be a realization than maybe some key element is missing. Thus, change is introduced into the mix and this is documented by the Scrum team. This change may likely go into the Product Backlog for inclusion in a future sprint. Finally, at the end of each sprint, the Scrum team conducts a Sprint Retrospective meeting. This meeting is attended solely by members of the Scrum team and the purpose is to give the team the chance to reflect on anything and everything that can be done to function and perform more effectively going forward. This entry was posted in Agile and tagged Agile, Agile Development, Agile Methodology, Agile Software Development, Daily Scrum, iteration, Product Backlog, Product Owner, Scrum, Scrum Master, Scrum Methodology, Scrum Overview, Scrum Team, sprint, Sprint Backlog, Sprint Planning Meeting, stakeholder, What is Scrum. I am a Program Manager, Enterprise Architect and Software Engineer who is passionate about the world of enterprise software development and the role that IT plays in the advancement of business. C# is my language of choice and I am an avid evangelist for the .NET Framework, but do not believe any single tool or approach is the answer to all problems. I have been a devoted workaholic for the last 20 years but when not at work, I am an avid outdoorsman, and a struggling golfer.